Of all the various manifestations of popular art, song is undoubtedly the one with the greatest ethnic and psychological value; through it may be glimpsed and studied the most profound and unplumbed manifestations of the soul of people. That observation from the Catalan folklorist Joan Amades appears in the booklet of Montserrat Figueras' Songs from the Thousand-Year-Old Land of Catalonia. 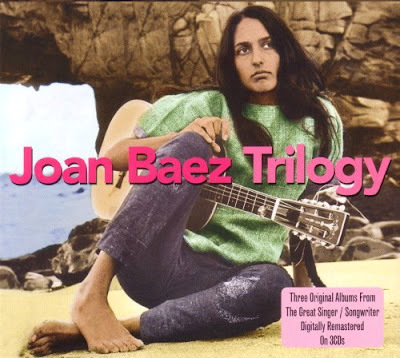 Seen above is the recently released Trilogy album which packages Joan Baez's first three albums, all icons of popular song, together at an astonishingly low price. Joan Baez, together with Björk, is headlining the 2012 Fez sacred music festival. In 2010 Montserrat Figueras and Jordi Savall took their Jerusalem project to the Fez festival. The Quaker faith of Joan Baez's parents was important in moulding her pacifism. In 1915 peace activist, Catholic monk and author Thomas Merton was born in Prades in French Catalonia to a New Zealand father and American Quaker mother. Joan Baez visited Merton at his Trappist monastery at Gethsemani, Kentucky in 1966 and they drunk beer together and discussed sixties music. Benjamin Britten and Michael Tippett are among the musicians influenced by the irenic tenents of the Quakers. In his 1942 submission to the tribunal for the registration of conscientous objectors Britten said "I think with the Quakers I might find a spiritual home". Britten attended the April 1936 International Society for Contemporary Music festival in Barcelona, the capital of Catalonia, where, incidentally, he heard Berg's Violin Concerto for the first time. The orchestral suite Mont Juic (1937), which Britten composed jointly with Lennox Berkeley, is a memento of his visit. In July the same year the Spanish Civil War broke out; this confirmed Britten’s pacifism and inspired several works including a Pacifist March for the Peace Pledge Union. Both Pablo Casals, who was an early influence on Jordi Savall, and the Quakers played an important role in helping refugees from the Spanish Civil War, as is recounted in my Postcards from a forgotten concentration camp. In the first draft lottery I got a low number, and after some consideration decided to go the conscientious objector route. The little handbook the Quakers put out was by far the most helpful resource on how to go about it. Perhaps neither here nor there, but the cellist on Mantra Mountain is a life long practicing Quaker, and I always feel he and Lama Tashi share a quietude not often encountered.